When you think of the UK’s leading European camping specialist, Eurocamp, a tranquil and relaxing break might not be what first comes to mind. 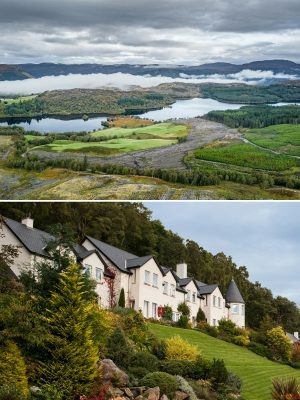 I had always assumed the outdoor self-catering specialists were a go-to for families, perfectly catered for excitable children on their summer holidays and not necessarily somewhere couples would go to unwind. 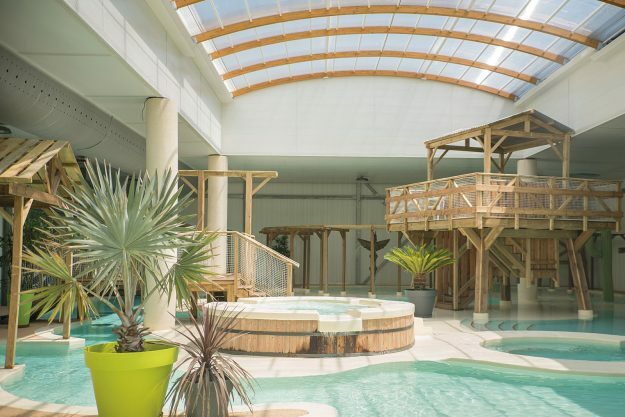 We wanted a long, relaxing break and – despite my concerns – took the plunge and spent ten days at two different Eurocamp holiday parcs in southern France, and we’d do it again, tenfold. 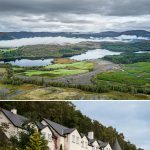 While the holiday parcs are the perfect oasis for families with children – and I’ve recommended them to many – if you get it right, they are also dreamy for those looking for a bit of a spa break. We stayed at Aluna Vacances and Les Ranchisses in southern France and spent evenings playing cards on our private decking and our days exploring some of France’s most beautiful towns. In fact, we managed to perfect an amazing ratio of downtime, culture and activities during our holiday and enjoyed coming back to our mobile home every night. We went through countless books, visited many markets, spent many days lounging around the pools and canoed 15km through the Vallon-Pont-d’Arc. We also visited Balazuc – listed as one of the ‘most beautiful villages of France’, as well as a ‘Ardeché village of character’ – and spent an evening walking around the picture-perfect cobbled streets and dining at a local restaurant. All of this and we were never more than 30 minutes away from our own private Eurocamp holiday home, which we grew incredibly fond of. 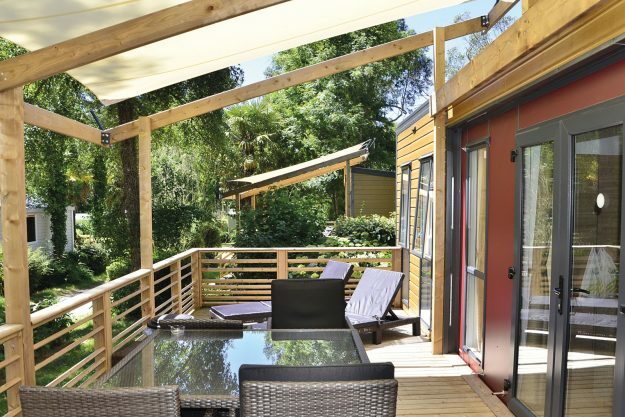 Aluna Vacances was the first parc we stayed at just 2km from the beautiful Ruoms – a medieval town full of narrow streets adorned with fairy lights where local bands play while you eat alfresco – and 11km away from the famous Pont d’Arc with amazing views of an Ardeché gorge. We stayed here for five nights in the Aspect – a three bed, one bath Eurocamp mobile home with private decking and air conditioning – and loved every minute. The holiday parc is busy and bustling, with six pools on site, a restaurant, a bar and entertainment. However, it’s also surrounded by incredible natural surroundings and sits on 15 acres, so you can easily retreat to your own decking among the trees when you want tranquility. The giant swimming pool complex also means it’s relatively easy to find a quieter spot if you want to. We did a bit of both, lapping up the sun poolside or enjoying a beer at the bar, while also getting the sun loungers out back at the mobile home in our own company with our own music. On wet days you can take yourself to the indoor spa or sit out again on the decking – which has overhead cover on Aspect – and enjoy the pitter patter of rain with a glass of local red and olives. 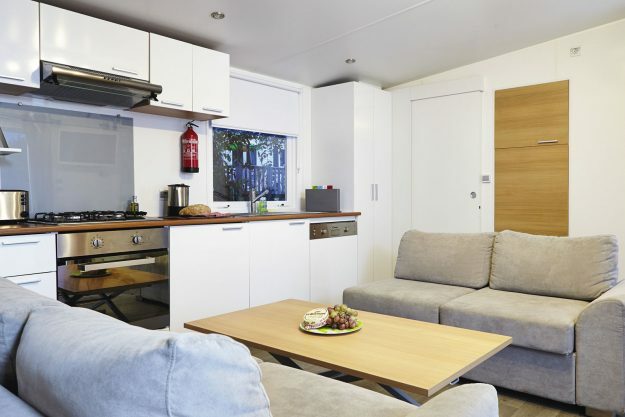 Aspect sleeps eight people, featuring a double bed, a twin room and a room with bunk beds, it was also immaculate and modern, with a power shower, a fully functioning kitchen and dining table with decking that doubled the size of the mobile home. After Aluna Vacances we travelled to Les Ranchisses, a quieter campsite outside the idyllic town of Largentière. Here we stayed in the Vista – a Eurocamp mobile home featuring two beds, two bathrooms, decking and air conditioning – where we made use of the barbecue and soaked up the backdrop of the magnificent hills. There’s a real rugged and relaxing feel to Les Ranchisses, which has its own lagoon so you can canoe and fish free of charge in the afternoons. Not only that, but those wanting true tranquility can take to the “adult only” swimming pool, it features a balnéo pool with swan neck jets and submerged bubbling loungers. The backdrop is heavenly too, surrounded by nothing but luscious green mountains. The wellness centre includes a jacuzzi, steam room and sauna as well as a gym. We booked in for full body massages at the parc’s Spa Complex too. While Les Ranchisses is a bit more rural than Aluna Vacances, you don’t have to venture far for a great meal. The shop onsite offers local wines and food which you can take back to Vista and cook up a storm to scoff down while the sun sets to birdsong. Alternatively, the restaurant on site is incredible, and we enjoyed some of the best food we had during the entire trip with ambiance to match. 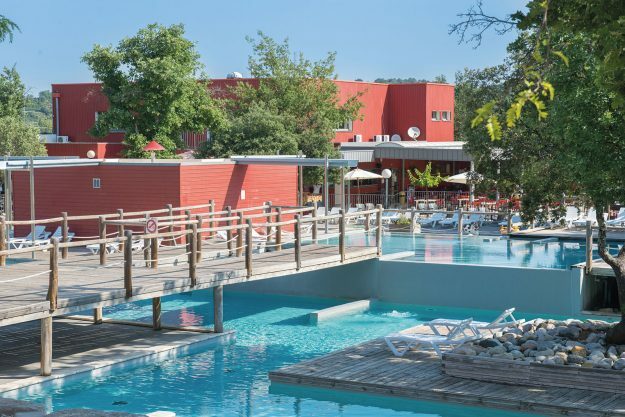 The Eurocamp hosts at both parcs are beyond helpful, with knowledge on the surrounding areas and tips and advice on what to book and where to stay. 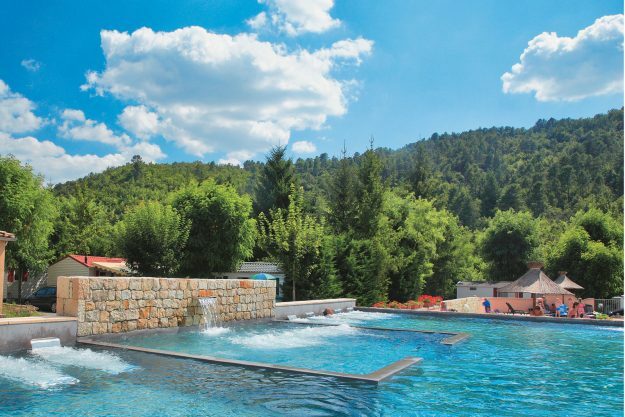 Whether you’re looking for a fun family holiday or a relaxing spa break, Eurocamp should definitely be on your list. We decided to drive to southern France and took a ferry crossing at Dover to Calais, where we had an easy – although very long – drive to Aluna Vacances. You can book your ferry crossing with Eurocamp. 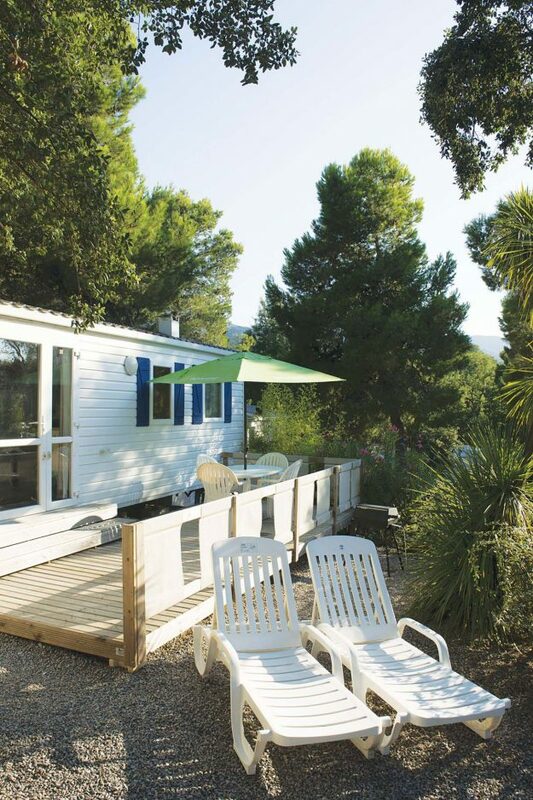 Les Ranchisses £336 per party for 7 nights in a 2 Bed + 2 Bath Esprit arriving 18th April 2019. Aluna Vacances £357 per party for 7 nights in a 3 Bed + 1 Bath Espace arriving 17th May 2019.